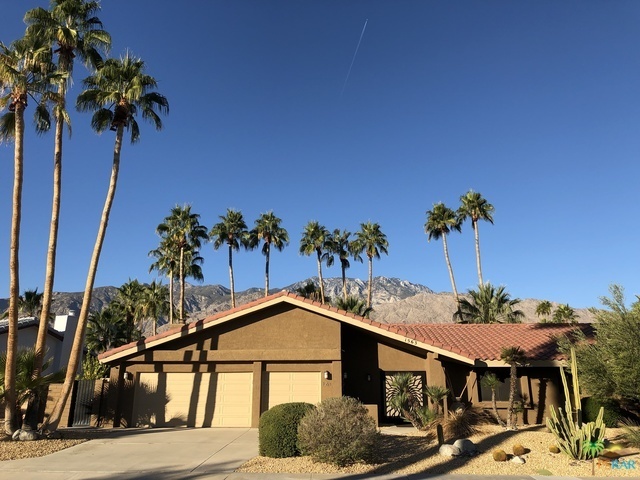 Fabulous family home in the desirable Los Compadres/Sonora neighborhood of South Palm Springs. A stone's throw away from golf, shops, restaurants, supermarkets, post office and more. Downtown Palm Springs is only a few minutes ride away. The home was fully remodeled in 2014 employing high-end finishes and accents. A new central A/C system was installed in 2017. Loaded with features like solar power, EV-ready three-car garage, water softener and filtering systems, monitored alarm, online security cameras, online thermostat, Italian tile flooring, granite and quartz counter tops, UV rated windows, recessed LED lighting, ceiling fans and a fireplace. The majestic kitchen features custom cabinetry, state-of-the art appliances and a massive custom-cut granite island. The spacious backyard features mature landscape, a crystalline pool & spa, BBQ/bar, and a beautiful fountain set on a lovely patch of green turf. All this is topped off by great mountain views. Shown by appointment.